Airbnb has told its members "we are not going anywhere", after a judge in New York ruled a man who rented out his apartment through the site broke the law. Nigel Warren was fined $2,400 (£1,600) for subletting his apartment to a Russian tourist in December. The judge said he broke a law stopping people from subletting for fewer than 30 days. 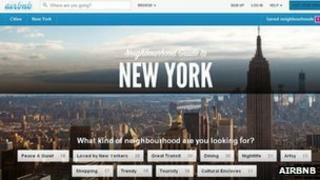 Airbnb helps its members to rent out their spare rooms or homes. Mr Warren said in a statement: "I like what Airbnb does, and I don't want this ruling to stand in the way of what I think is, overall, a great start-up." However, some have started speculating at what this could mean for the future of Airbnb, which has also faced problems in Amsterdam. In an email sent to its New York members on Wednesday, the company said: "We know from the amazing stories you have shared with us that many of you depend on the extra income you earn from hosting to help you afford to stay in your homes, make ends meet, or simply follow your dreams. "And beyond the economic benefits to you as hosts and the neighbourhoods around you, Airbnb is a community of people establishing connections and making new friends around the world. So we are not going anywhere." Airbnb, who helped Mr Warren with the case, said in the email: "We intervened in this case because it was so clearly contrary to the intent and text of the New York law, and we are already examining our options to appeal this ruling on Nigel's behalf." The firm is lobbying to change the 2011 law, which was introduced to stop landlords from turning their homes into illegal hotels. It added: "As always, we urge our hosts to learn about and obey all of the local laws in their cities. But it is often hard to predict how individual city administrators will interpret laws like this, and that needs to change." The San Francisco-based company has 300,000 listings in 192 countries. As of Wednesday, it had 22,677 listings in New York. According to the New York Post, Mr Warren was cited when a city inspector was in his building for other reasons and came across the Russian tourist, who revealed details of the deal. Airbnb battles: Would you stay with strangers?